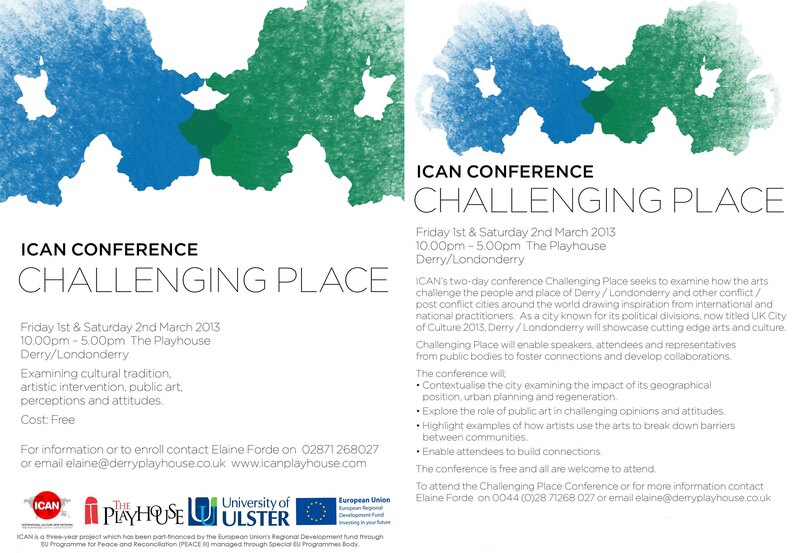 ICAN’s two-day conference Challenging Place examined how the arts challenge the people and place of Derry / Londonderry and other conflict / post conflict cities around the world, drawing inspiration from international and national practice. Hosted in Derry / Londonderry, a city known for its political divisions, and recently titled UK City of Culture 2013 at the time, Challenging Place enabled speakers, attendees and representatives from public bodies to foster connections and develop collaborations. The conference contextualised the city, examining the impact of its geographical position, urban design and regeneration, explored the role of public art in challenging opinions and attitudes, highlighted examples of how artists use the arts to break down barriers between communities, and enabled attendees to build connections.